Home > Gaming > PC Games > Mario vs Link vs Donkey Kong. Evolution. Some of them I extracted from in-game footage, others are from the web. 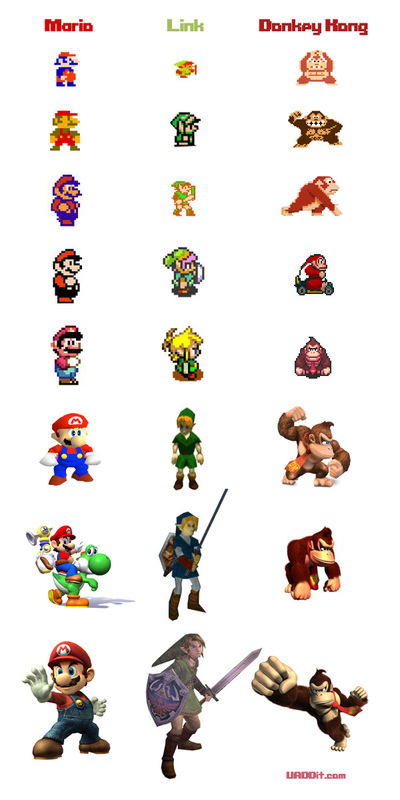 Of the three, the one I like the most is Donkey Kong. Actually my favorite game is Donkey Kong Country for SNES. Very cool idea, but the "evolution" aspect of this collage is super wrong. Most of this stuff is out of order. Perhaps a "progression of graphical enhancements" might be a more fitting title, but even that is still grabbing at straws. Similar Threads for: Mario vs Link vs Donkey Kong. Evolution.